The Wooly Willy Magnetic Drawing set proves the wisdom of the adage, “If it ain’t broke, don’t fix it.” The toy was initially brought to market in 1955 and remains virtually unchanged today, with more than 75 million copies sold along the way. 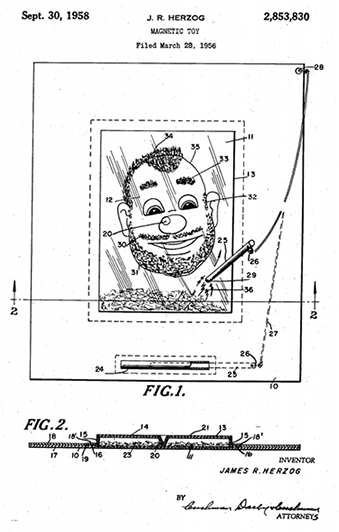 Wooly Willy consists of a drawing of male face housed under a plastic, anti-static bubble, and a magnetic wand. The bubble cover contains magnetite powder, and kids use the drawing wand move the dust around and endow Willy with facial hair. Once Willy’s mustache, beard, sideburns, eyebrows, and hair are in place, kids can pass the wand on the under-side of the card to make the powder stand on end for a bushier appearance. Wooly Willy was invented by James Herzog while he worked at the Smethport Speciality Company in Smethport, Pennsylvania. In the 1950s, the company produced a variety of magnetic and metal toys. In 1955, Herzog found that the powder created from grinding magnets made a perfect drawing tool. His brother Donald suggested using a clear, vacuum-formed plastic bubble to contain the magnetite powder, and Leonard Mackowski, a local artist, was commissioned to design the display card. After being rejected by numerous buyers, the $0.29-cent toy was eventually picked up and went on to enjoy great popularity. 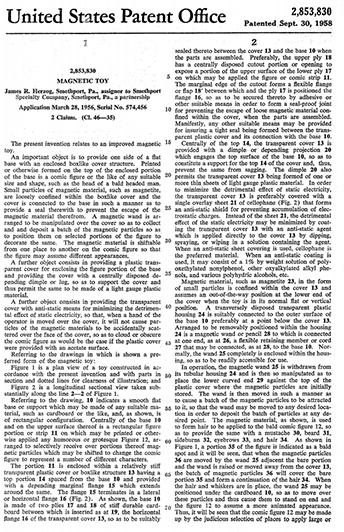 United States Patent #2,853,830, filed March 28, 1956, on behalf of inventor James Herzog, highlights the packaging, illustration, and magnetic drawing wand. 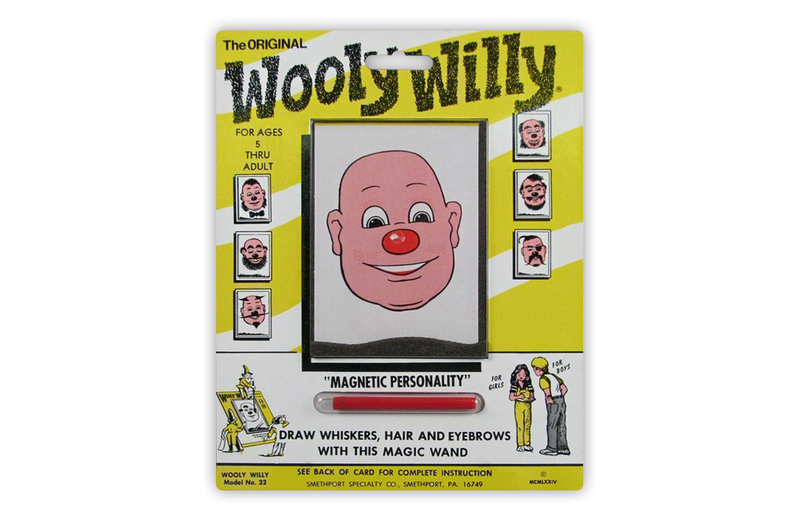 The success of Wooly Willy has led to a number of complementary products and knock-offs of the “magnetic personality” drawing theme. One example is Dapper Dan The Magnetic Man, a larger version. The product family today includes the original Wooly Willy, Sock Monkey Wooly Willy, Buddy Beagle, Hair-Do Harriet, and a classic Western Wanted poster. Through it all, the Smethport Specialty Company continues to produce the toy, albeit at a slightly higher price point of $1.99. In 2008, the company was acquired by Patch Products (now known as PlayMonster after a name change in 2016).